We pledge to provide support and understanding to all those who seek to make Vancouver Island communities stronger through effective fundraising. 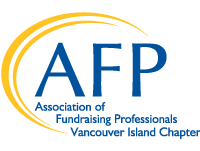 AFPVancouver Island strives to reflect the diversity of Vancouver Island within our membership, including the many cultures, places, genders, orientations, heritages, organizations large and small, languages, and faiths that make up our island’s communities. AFP Vancouver Island is proud to be a recipient of the 2019 Friends of Diversity Award.